Our 8x8" Flushmount and 9x9 Matted linen albums are the most popular with parents. They have portability and style. The Flush-Mount is sleek and contemporary whereas the Matted is classic and has a more traditional feel. Both styles are available in rich linen in either oatmeal or gray. 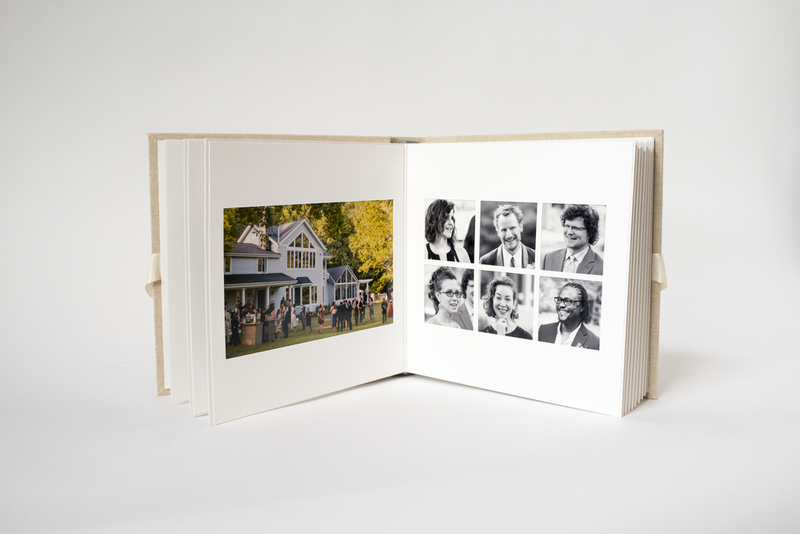 The albums allow for 20 sides (about 40 images) making it perfect for parent albums, family celebrations and baby albums. It's all in the details … these albums are beautifully presented in a matching clamshell box with magnetic closure. The album itself is tied shut with a ribbon, making it the perfect package. They may be one of our smaller products but they certainly makes a big impression! "Our family wants to thank you for the phenomenal work you did in putting our album together from our children’s wedding. It is absolutely beautiful and exactly what we were hoping for. You were all a delight to work with from the actual time we spent with Craig at the wedding and party through choosing pictures and creating the album. Your suggestions were greatly appreciated. We would be so pleased to recommend you to anyone about to begin this celebration process."